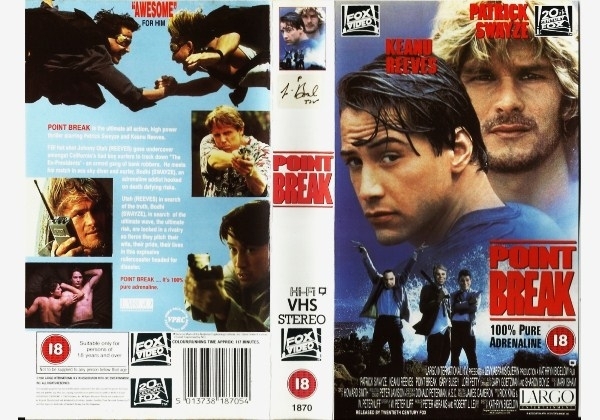 POINT BREAK - all action, high power thriller starring Patrick Swayze and Keanu Reeves. FBI hot shot Johnny Utah (REEVES) goes undercover amongst California's bad boy surfers to track down 'THE Ex-PRESIDENTS' - an armed gang of bank robbers. He meets his match in ace sky diver and surfer, Bodhi, (SWAYZE), an adrenaline addict hooked on death defying risks. In search of the truth, fierce rivalry follows in a game of ever more dangerous dares. They pitch their wits and their pride in explosive rollercoaster ride of sensational stunts and steamy nights. POINT BREAK .....It's 100% pure adrenaline. Or find "Point Break" on VHS and DVD / BluRay at Amazon.